Joseph Fiennes (Hercules), Tom Felton (Harry Potter franchise), Academy Award® nominee Peter Firth (Best Supporting Actor, Equus, 1977) and Cliff Curtis (“Fear the Walking Dead”) star in the biblical epic Risen, debuting on digital May 10 and on Blu-ray, DVD and next-generation 4K Ultra HD May 24 from AFFIRM Films and Sony Pictures Home Entertainment. The faith-based drama follows Clavius (Fiennes), a powerful Roman military tribune, and his aide Lucius (Felton), who are tasked with disproving the rumors of a Risen Messiah in the weeks following the crucifixion of Christ. Risen also stars María Botto (“Mad Dogs”), Antonio Gil (Quantum of Solace) and Luis Callejo (The Boat). 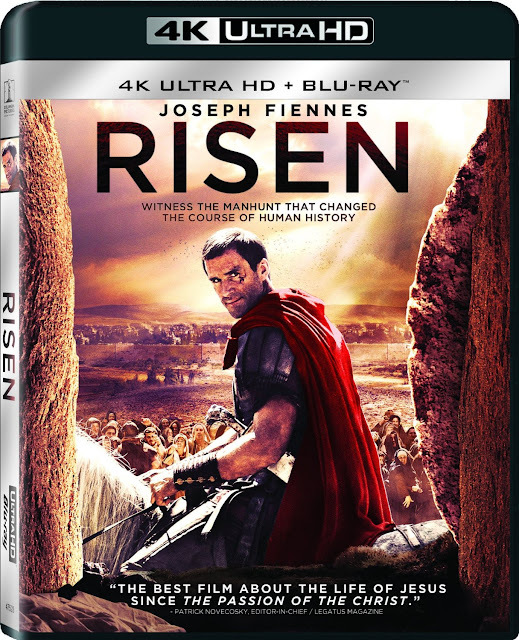 Where most religious movies end with Jesus’ crucifixion, Risen begins with it. Seen through the eyes of a non-believer, Risen weaves a fictional account of Jesus’ crucifixion and rising with actual stories from the bible. Clavius, a Roman soldier in the employ of Pilate and one of his most trusted soldiers is assigned to oversee the crucifixion of Jesus and his removal from the cross. When he instructs his soldiers to remove him, he is asked if his followers can entomb him instead of burying him in the communal pit. Clavius allows this, and seals the tomb with rope and wax, but on the third day, when the seals are broken, the body of Jesus is gone. 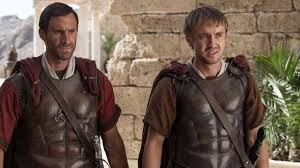 When Pilate finds out, he tasks Clavius and his apprentice, Lucius, to find out what happened to the body. Clavius searches for Jesus’ body and searches for the disciples, who he’s unable to find until he follows Mary Magdelane on evening a few weeks later. Clavius enters the room and finds Jesus sitting with his disciples. 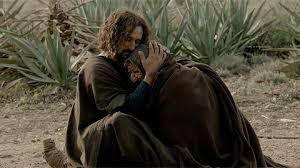 He leaves the room and tells Lucius and his other guards to wait outside and when he returns, he sees Jesus is still there. But when he blinks, all of a sudden, Jesus is gone. When the disciples set out to the sea to fish, Clavius follows them hoping to find them meeting with Jesus. When the disciples find him following them, Peter invites him to join them so he can see first-hand the power of believing. As Clavius follows, he begins believing, because how else can he explain what he’s seeing. I was unsure of this movie when I first received it. I’ll admit, I did want to see it in the theater, but missed it and it just wasn’t something I likely would have purchased. That said, I did enjoy the story. As a practicing Catholic, religious movies are difficult for me because of everything I have ever been taught. However, the premise of the movie – a non-believer trying to figure out what’s going on – intrigued me and I watched it with an open and curious mind. 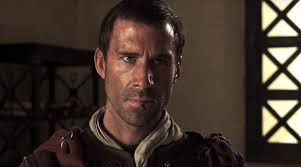 I really enjoy Joseph Fiennes in all his roles and thought he did a great job as Clavius, the Roman non-believer and soldier to Pilate. He was believable and showed his astonishment at seeing Jesus well. His facial expressions and his mannerisms were good and it was easy to relate to his surprise at the different events. Tom Felton was great as Lucius, though I fear him getting typecast as a villainous character all the time, now. The character I didn’t enjoy was the actress who portrayed Jesus’ mother, Mary. Her grief seemed overly dramatic and her actions looked forced. I understand it was a small role and in the grand scheme of the movie, not that significant, but she is an important character, and I thought she should have been more believable. 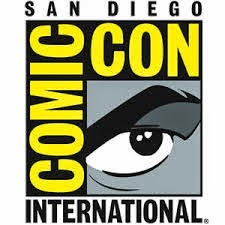 Risen’s widescreen presentation was pretty good. The picture was clear and the color palette was good. In the dusty desert of biblical times, it’s important to get the sets and color schemes right and the art directors did a good job in this movie. Transitions between scenes was smooth and there were not visible issues with any of the picture. It’s hard to get period pieces right, but this was done really well. 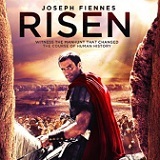 The English 5.1 DTS-HD Master Audio soundtrack for Risen was good. Dialogue was easily heard and I had no problems with the volume levels. The background sounds were well done and not distracting. All parts of the soundtrack matched well and I heard no problems. Other languages available are English and Descriptive Service, French 5.2 DTS-HD Master Audio, Spanish 5.1. Subtitles in English, English SDH, French and Spanish are available if they are needed. I really enjoyed the special features on this disc. They were all so informative and interesting. Feature Commentary with Patrick and Paul Aiello (1:47:38) – Commentary on the movie with Producer Patrick Aiello and Paul Aiello. A discussion of the movie from the eyes of the writer and a producer was super interesting and I really enjoyed hearing their thoughts on the movie. Deleted Scenes (4:24) – Five deleted scenes from the movie. All good scenes, but didn’t add much to the movie. The Mystery of the Resurrection: Making Risen (11:14) – Thoughts from the cast and crew of the movie on the story, and how they all felt about the source material, the story and how it affects life today. Creating A.D. Jerusalem (9:29) – The designing of the ancient and Holy city of Jerusalem. Thoughts from the designers and crew on how the city was built and created in Malta and Spain. The Battle of the Zealots Deconstructed (5:03) – A quick look at how the opening scenes were created and what eventually led to Clavius’ change of heart. Script to Screen (3:57) – A look at how the movie went from a story and a script to the filming and release of the final product. Previews – The six previews from the beginning of the disc. Risen was entertaining to watch and as someone who went to Catholic school and attends church often (not every Sunday, but many Sundays), I liked the movie and its premise. Is it something I’ll watch again? I don’t know. I do know I’ll pass it along to others who are interested in watching it. That said, I enjoyed seeing the Resurrection and Pentacost from a different point of view and it really made me wonder what Pilate and his soldiers really thought.